Bus services in Canberra, ACT, will cease for four hours later this month so workers are able to help negotiate their enterprise agreement. The meeting has been authorised by Action management and the Transport Workers Union, which about 700 people are expected to attend. Public Transport Director James Roncon says the scheduled meeting between the TWU and their members to discuss Actions enterprise agreement is a positive outcome in the overall bargaining process. "Negotiations have been taking place in good faith and this is the next step towards reaching agreement and finalisation of the process," he says. "The intention is to conclude negotiations as quickly as possible for the benefit of everyone involved, including drivers and the general community." Transport Workers Union ACT Sub-Branch Secretary Klaus Pinkas says coordinating the meeting is a logistical exercise, but is necessary so the union is aware of what members want. He says the have been negotiating the agreement for about six months, and he has no expectations as to what the outcome of the meeting may be. "We walk in and say ‘ok, what do you want?’ We don’t walk into the meeting with any expectations one way or another." Bus services will be temporarily suspended allow for the essential scheduled meeting. "Notices will be put on display in each of the major bus stations to notify patrons," says Roncon. "Staff will also be at the major bus stations on Wednesday reminding people of the disruption to services." He says the disruption to services is not desirable and apologised for any inconvenience to bus users. The meeting will be held from 10am to 2pm on October 30, which means no bus services will be run – morning peak, afternoon peak, school and special needs services will not be affected. 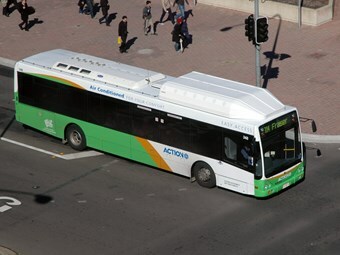 Bus users can visit www.action.act.gov.au for service information and updates.